S.F. case is making headlines. – The man who struck and killed a person in a crosswalk while riding a bicycle in San Francisco was charged with felony vehicular manslaughter and is now expected to surrender to an arrest warrant. The story has garnered national media attention, including stories in < a>, the Los Angeles Times, and the Wall Street Journal. – The 2012 Reve Team — a group of women (including two from Portland) that will attempt to ride the entire Tour de France route later this month — got front page coverage in the Sunday Oregonian. 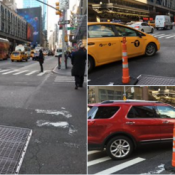 – A woman who killed a man on a scooter with her car in New York while she was texting while driving will not face jail time after pleading guilty to the charge of negligent homicide. – The husband of a woman who died while riding a bicycle in Utah is considering legal action, saying a “misplaced and unsecured” construction sign was responsible for her death. – India’s state governments are starting to give girls and young women free bicycles after the government realized access to a bicycle enables the girls to access and attend school. – Tokyo’s government is considering requiring bicycles to have numbered license plates in an effort to improve safety and “etiquette” on city streets. – Chicago recently held its second Cargo Bike Roll Call, bringing together a mass of people who love the utility of cargo bikes, trikes, and trailers. – Street maintenance, specifically potholes, have become a significant political issue in San Diego’s mayoral race. – A member of Newport Beach’s bike safety committee was allegedly asked by Newport Bay Police officers to destroy photo evidence of a collision between a person riding a bike and a person driving a car. – Over 2,000 people turned out for L.A.’s 12th annual Los Angeles River Ride. 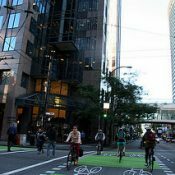 – San Francisco Bicycle Coalition Executive Director Leah Shahum knows that her city has come a long way in terms of bicycle access, but there’s still plenty of work to be done. – Vancouver, BC’s new ‘V-pole’ aims to reduce sidewalk clutter, something Portland is no stranger to, by consolidating many utilities in one single street pole. – Also in Vancouver, the city has officially recommended a series of “trial” buffered bike lanes be made permanent. – A study has come out about helmets and people who use Washington DC’s bike share system. Some people are fretting about the low rates of helmet usage but as the WashCycle points out, people may be wearing helmets less because bike share bicycles are arguably safer than some other bicycles and perhaps we should be focusing on another important statistic. – Mountain Gear’s founder Paul Fish built himself a bamboo bike that’s road-worthy enough to cruise at 25MPH. – Google is mounting StreetView-style cameras to backpacks to capture images of walking trails, similar to how they’ve been utilizing cameras on bicycles to capture pieces of the transportation network where motor vehicles are not allowed. – It turns out that younger people’s desire to bike more and drive less is about more than simply saving money. — Did you find something interesting that should be in next week’s Monday Roundup? Drop us a line. For more great links from around the web, follow us on Twitter @BikePortland. Utterly unbelievable that a cyclist gets charged with vehicular manslaughter when this happens, yet someone in a 2000lb metal death-machine gets a citation and fine. Yes, I was also quite shocked to read that headline, then just a few down read that “woman who killed a man on a scooter with her car in New York while she was texting while driving will not face jail time after pleading guilty to the charge of negligent homicide”. Seriously, WTF is up with that? These events happened 3000 miles away from each other in different jurisdictions. Different parts of the country have different laws, may apply similar laws in a different manner, and may dole out different punishments for the breaking of the same law. It may not seem fair, but it’s hardly fishy. Okay, comparing apples to apples then, the LA Times article quotes one person as saying three pedestrians are hit by cars every day in SF. 55% of all traffic fatalities are pedestrians there (compared with 12% nationally). Yet, I don’t hear about texting drivers or yellow-light punchers going to jail over it in SF. If you’re saying that driver’s running yellow lights and killing pedestrians, as the SF cyclist did, are not going to jail…and you’ve done a little searching around with results that support such a claim, that might be something worth hearing more about. I have no idea if they’re going to jail. They’re not covered by the media with such fervor. “…Second, we recognize that part of the reason this case has drawn so much attention is because this kind of incident is so rare. Unfortunately, though, pedestrian injuries and fatalities are not rare in our city. In 2011, 17 pedestrians were killed in San Francisco, and the vast majority of those tragedies were caused by people driving. Within one week of the March 29 incident at Market and Castro Streets, there were two other pedestrian fatalities, both reportedly caused by people driving. Yet these tragedies drew little attention. The bike/pedestrian type collision that SF Bike Coalition refers to is in no small part, rare…by simple fact that the number and percent of bikes traveling the street, compared to that of motor vehicles traveling the street is vastly smaller. That rarity would likely be a significant reason bike/pedestrian collisions resulting in death are subject to more reporting from the media than are motor vehicle/pedestrian collisions resulting in death. It seems to me there’s additional reasons that bike/pedestrian collisions may be subject to more reporting than are motor vehicle/pedestrian collisions. It’s possible that motor vehicle collisions are subject to less reporting in favor of their being the overwhelmingly dominant mode of travel on the road. That’s the kind of thing that can be far easier to assume than prove. Drivers that kill pedestrians in SF are prosecuted at a rate of 9%. That includes everything from tickets to felony charges. Cyclists that kill pedestrians in SF are prosecuted 100% of the time, with initial felony charges 100% of the time. Someone’s priorities are seriously farked. So because you don’t hear about it, it must not be occurring. The best observation in that article was about 105 cyclists passing a 4-way stop within 15 minutes and only 15 acknowledging the stop. You want to know why drivers aren’t big fans of cyclists. Right there is your answer. a cyclists running a light at speed and killing a pedestrian is not the same thing as rolling slowly through a stop sign. but don’t worry i am sure that you will be able to post your screed in the next ladd’s addition stop sign thread. its been about a year so i think we are due for another. Where did it say “rolling slowly” in the article? It said ignored which could mean they didn’t slow down or even sped up. But I guess when 86% of cyclists break the law, you have to stretch the truth to make it the fault of someone else. Reports and video document that the people riding bikes or driving motor vehicles and ignoring the stop signs, rather than the people rolling them at a walking speed and conspicuously looking each before proceeding are exactly the people having received citations during the enforcement details that have been conducted at Ladd’s Addition. How come auto drivers usually wave me through a 4-way stop sign as I’m slowing down to stop? They must like me somewhat. Do drivers hate themselves as well? 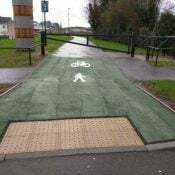 Their level of compliance to the law is the same as cyclists’. Do you have anything to back that up? Or is it more “anecdotal” evidence that proves nothing. In case you don’t feel like clicking, one thing it states is that 89% of people admit to speeding. It also says that 44% of people have received three or more tickets, indicating an ongoing lack of regard for the law. I should also add that if you read the link, the family of the victim in Brooklyn agreed with the plea agreement that was struck and are going to use that plea in their civil suit against the driver. Over at bikeforums, details about the SF collision have been discussed at length in Pt 1 and Pt 2 threads since the collision, which was some time ago. I’ve read parts of the first thread. Many readers are highly critical of the person biking having apparently blatantly run a stale light at high speed, subsequently colliding with and causing fatal injuries to a pedestrian. This cyclist should absolutely be charged with vehicular manslaughter. Done. No discussion. Because other road users get mis-charged or badly charged (or what ever you want to call it) doesn’t mean this idiot should get a free ride. Throw the book at him. Was the life taken worth less because they were hit by a bike? I don’t think anyone advocates for not “throwing the book at him” with regards to this particular cyclist. Rather we wonder why the same fervor does not happen when someone is speeding, not yielding, or texting while driving and they get a pass with the “I didn’t see him” clause. As we’ve seen in the media around here, it’s an excuse to get a simple infraction and traffic fine and not much else. A broadly stated generalization with absolutely no basis in fact. Traffic collision vary greatly in situation and circumstances. When the situation and circumstances related to a collision involving drivers of motor vehicles are as clear as the one involving the SF cyclist, people certainly do express desire for justice with accordant fervor. Oregonian article on Reve team was weirdly dismissive of their ability to complete the ride. Perhaps someone should tell them that people tour coast to coast in the U.S. on touring bikes and average 100 miles/day…while having to pitch camp every night and self-cater. Granted, biking across Kansas is easier than climbing Tourmalet, but I don’t think the achievement is at all out of reach for a supported group using paceline tactics on lightweight road bikes. I read the story and am not sure why you’d say the story was dismissive of their ability to complete the ride, weirdly or otherwise. In fact, it was admiring of their determination to embark on the challenge, but at the same time, inquired whether, with the resources they have at hand, the ladies would be able to summon the extraordinary strength, conditioning and reserves necessary to complete a grand tour of this magnitude. 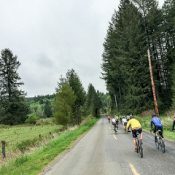 Not looking at the story right at the moment, but it quoted a two time tour rider here in Oregon saying ‘they won’t finish’…something to that effect. Still, additional remarks of his in the expressed that he was inspired and impressed with what they’ve set out to do. To which I would respond: plenty of touring cyclists do those distances with loaded bikes. Doing it supported on a road bike is not a cake walk, but it’s not like they’re having to meet TDF cutoff times either. I’ve averaged 90 miles/day for a week on a junk bike ($300 hybrid) while touring solo/unsupported in China…if I can do that, I don’t see why these women, who have been training for the event, should have any substantial trouble with their supported ride. Fair enough, offering the example of what touring cyclists you know of are a capable of. I think if the O was somehow dismissive of the ladies ambition, it was probably unintentional. I think there’s probably a lot of people not very aware of just what level of effort a non-racing person can accomplish on a bike. Maybe in preparing for the story, the Oregonian should have asked a few more Oregon cyclists their thoughts about what the ladies would be facing and what their chances of making the ride on schedule were. By they way…hope you did, or will post a comment encouraging the ladies, to the Oregonian story. Mostly good comments there, with the exception of one particularly snippy person having commented multiple times with at least one post unpublished. Well the Tourmalet certainly has its elevation gains, but try ridin’ from Osage City to Cottonwood Falls in July, straight into 35mph S.W. headwinds with 40mph gusts, and 112 in the shade! 70 some odd miles @ 7mph average, fully loaded. arg! A lady here in Ohio “accidentally” injured about 30 people over the weekend when she drove into a crowd during a festival. Thankfully, nobody has died that I’m aware of. Place your bets, though, on whether or not she will be charged with anything! Contrast the above with reports of the SF cyclist, who I recall from news stories and discussion in the bikeforums threads, being described as having deliberately sped through a yellow light after other traffic had stopped. So gross negligence is fine, provided you didn’t have a few beers beforehand? I love America. Northwest Ohio police and investigators, on the scene, with all the resources they have to investigate the incident, don’t believe they can draw a conclusion about cause until possibly weeks pass. Yet here you are, without offering anything to show that you know something about the incident other than what the news story reports, having already drawn the conclusion that the cause was “…gross negligence…”. You haven’t offered anything to support a conclusion that the cause of the incident in Ohio involving a motor vehicle driver and festival attendees was “…gross negligence…”, or if such an absence of responsibility was a factor in the in the incident, on whose part it was due to. Probably not gross negligence (as you said, no way to know), but the vehicle left the road, and plowed through a crowd of 50 people at 20 mph for 50 feet. Not a normal occurrence. It will be interesting to see what the investigation reveals. It’s entirely possible she had a seizure, stroke, or other medical condition that caused her to lose control of the vehicle – and that would be a legitimate accident. Matt…I’d say, ‘may not be gross negligence’, keeping in mind the story does tell of the closing hours of a festival gathering, reporting that people were lined up for the last call. The opportunity was there for the person driving to have gotten drunk. And as you’ve noted, seizure, stroke, or other medical conditions are also possible contributors to the incident. In Vancouver, the bike lanes in question are cycle tracks or protected bike lanes, not buffered lanes. This is a very important distinction, in my opinion. Also, those lanes there provide a direct connection through the heart of the dense downtown core, and this is a very important win for bicycling in the city. This is yet another city moving ahead of PDX in terms of protected bike lanes. In the NYC story, it should be noted that the Fifth Avenue in question is in Bay Ridge, which is in Outer Brooklyn, not in Manhattan. In other words, this story is about a district with substantially fewer cyclists, and has much less importance in terms of citywide affairs. Also, it seems that guy in the story hasn’t been outside much, and certainly not to inner Brooklyn or Manhattan, where utility cycling is now ubiquitous. Just a technical correction on the reporting. You said he was convicted. He has been charged not convicted. Innocent until proven guilty. i have absolutely no problem with the cyclist in SF being charged. but it should be stressed that this is an incredibly rare event and the vast majority of pedestrians are killed by motorists. it is also sad how this tragedy being used by our utterly useless media to inflame the bike vs car culture war. In no small part, because the vast majority of vehicles on the road are motor vehicles. Do the number of bikes traveling on Downtown SF streets exceed…let’s say… a figure of 8 percent of all vehicles traveling the street? Which I think is one reason the story is getting so much play. The fact that this is so unusual makes it news. Dog bites man: (car injures/kills pedestrian) not news, man bites dog: (cyclist injures/kills pedestrian) big news. 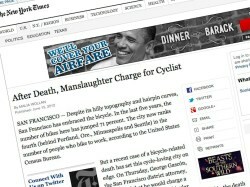 As to whether the decision to charge the cyclist with a felony tells us that motorists inflicting death are undercharged, I don’t think so. Each case has to be judged on its own merits. We also don’t have any peer-reviewed data analysis that tells us so. Might be an interesting project for a criminology major, which could be the basis for an advocacy effort. Data analysis has proven multiple times that black offenders that kill white victims are much more likely to be sentenced to death than blacks or whites who kill blacks. Much more difficult to prove that racial animus contributed to a death sentence in a particular case. I think the same is true regarding who gets charged with what when somebody in a car or on the bike kills someone. While on the other hand, you’ve been immensely helpful in not ratcheting up the rhetoric. Great news about the low helmet usage, the goal of every city should be 0% helmet usage. Another important distinction between NY and SF issues: The woman in NY plead to the lesser crime–that does not mean that was the original charge against her. Likewise, the cyclist in SF will likely be offered a plea option that will reduce the penalty, severity, etc. This is the system at work–the DA will have to decide if he/she can meet the burden of proof for the higher crime, in a reasonable time/cost/etc and the accused will have to decide if it is worth it to risk an all or nothing trial. I would imagine a plea would make sense for all parties. Good job on the monday round up, lot’s of interesting stories.